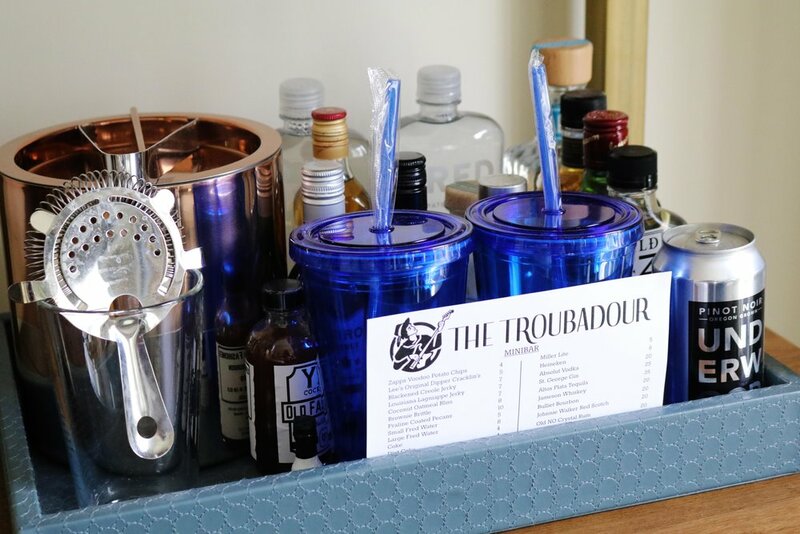 We checked out of our first hotel of Essence Festival weekend early after a negative experience, but luckily we were able to find a lovely room at The Troubadour just less than 3 minutes away walking distance. As terrible as our situation was, I was a little afraid to check-out during such a busy and booked weekend, but it all worked out. Just half an hour before 3PM, we called to make a reservation with the front desk and were in our new room by 3:15PM. I'd seen several photos of The Troubadour while planning the trip to New Orleans and fell in love, but decided to go with "the other hotel" -- mistake. The experience at The Troubadour was exceptional. Everyone was personable, the property had plenty of charm with its '20s art deco-inspired design, it was clean and I felt far more comfortable overall. Needless to say, it surpassed my expectations. This little gold key card was the key to joy after our previous experience, and my eyes opened wide like a kid at Disney World as soon as the door opened. Simply tap the key against the pad on your guest room door and in the elevator to choose a floor. The decor in the room is '20s art deco meets mid-century modern which I absolutely love! Honestly, I think this may be my next design scheme. The bed was so comfortable! I'm not sure what the thread count was, but it was certainly up to par and I slept like a baby. I loved this hip digital clock on my side of the bed. The marble slab "nightstands" served as the perfect hub for electronic devices with USB ports and traditional plugs. Looking for an in-room dining menu or other hotel information? Check the tablet in your room for easy access! Unlike our other hotel during the weekend, our room at The Troubadour was clean and there was even a card left on the bed with our housekeeper's name. The mini bar was stocked with snacks and drinks! I honestly don't see these very often, but it depends on where you choose to stay. I later realized that the retro Igloo fridge was stocked with even more drinks. Liquor galore! Here's a closer look at only a little bit of what's available. There's tons of beverage options including tonic water and soft drinks, so you can be your own mixologist! Just a quick photo of me in one of the mirrors. I loved that this room had about three mirrors overall, so if you're traveling with other girlfriends, you don't have to fight over them...because it can be a struggle. The bathroom was pretty spacious with cute orange acrylic accessories and large, bright bulb lighting. I thoroughly enjoyed freshening up in the walk-in shower, too! The shower head was amazing and adjustable. I loved the exclusive Jonathan Adler amenities that you can't find anywhere else (trust me, I've tried to look). The scent was citrus and sandalwood, so it was great for both women and men. They smelled SO GOOD, y'all. Our room was the Neighborhood View which gives you a great look at downtown New Orleans...and the windows were very clean so that we could take it all in. At night (or during the day), the shades and sheer curtains can be closed which blocks absolutely all light. This is great for those who like to get a good afternoon nap or don't want to be bothered by the rising sun. The Fest Pecan Root Beer that I popped open from the mini fridge over the Reginelli's pizza we ordered (my side contained delicious crawfish). So sad that they're only available in Louisiana and Mississippi! This was my first time in New Orleans and I really wish I had more time to explore the property, but this will be my first choice when I return! I'd love to try the dining options and the chill-looking rooftop bar. An excellent first stay at The Troubadour for sure! It seems that depending on when you plan to go, prices aren't incredibly expensive either. I'd recommend this spot for anyone going to New Orleans for a girlfriends getaway or a weekend Baecation. It's very updated and designed with the millennial in mind!